The Southern Poverty Law Center and the Alabama Disabilities Advocacy Program filed suit today against the Alabama Department of Corrections for putting the health and lives of prisoners at risk by ignoring their medical and mental health needs and discriminating against prisoners with disabilities – violations of federal law by a prison system that has had one of the highest mortality rates in the country. The Southern Poverty Law Center and the Alabama Disabilities Advocacy Program (ADAP) filed suit today against the Alabama Department of Corrections (ADOC) for putting the health and lives of prisoners at risk by ignoring their medical and mental health needs and discriminating against prisoners with disabilities – violations of federal law by a prison system that has had one of the highest mortality rates in the country. The lawsuit, filed in the U.S. District Court for the Middle District of Alabama, describes how prisoners, including those with disabilities and serious physical and mental illnesses, are confined to prisons where discrimination and dangerous – sometimes life-threatening – conditions are the norm. Strokes, amputations and prisoner deaths that may have been prevented with proper care are detailed in the lawsuit. Alabama has the most overcrowded prisons in the nation and spends one of the lowest amounts, per inmate, on health care. The prison system contracts with Corizon Inc. to provide medical care and MHM Correctional Services to provide mental health care. In 2012, when the ADOC released a “Request for Proposal” for a new health care contract, applicants were scored on a 3,000 point scale. Out of a possible 3,000 points, contract price accounted for a possible 1,350 points. Qualifications and experience counted for only 100 points. 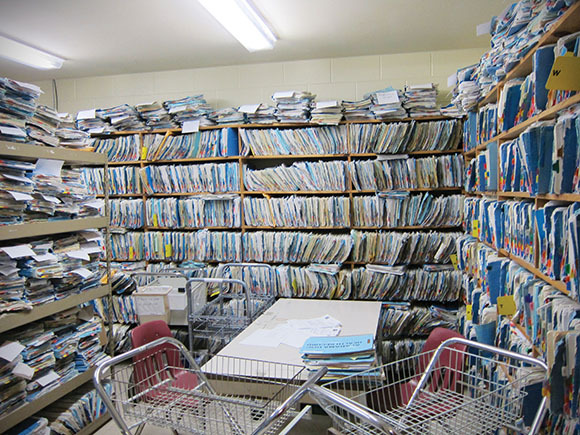 The ADOC renewed its contract with Corizon in 2012, even though Corizon (the company providing health care in Alabama prisons since 2007) failed every major audit of its health care operations in Alabama prisons under its first contract with the state. The department has a policy and practice of not treating hepatitis C. In April, 2,280 prisoners in ADOC custody had been diagnosed with it, but only seven prisoners were receiving treatment. A prisoner at Holman Correctional Facility recently died of complications from hepatitis C.
A prisoner stabbed 15 times with an icepick did not have his wounds cleaned or treated. Instead, he was placed in segregation for three months. He also suffered a cracked lens in his right eye at the county jail where he was held before being transferred to prison. He has been told the lens won’t be treated because he still has one good eye. A prisoner at St. Clair Correctional Facility with a history of heart problems had a new stent placed in his heart in 2012. Afterward, he was not given the necessary blood thinners at the prison, though the doctor had prescribed them. The prisoner’s blood clogged the stent, requiring emergency open-heart surgery to correct. In addition, prisoners have been placed under “do not resuscitate” or “allow natural death” orders without their consent or knowledge, according to the lawsuit. Moreover, although “do not resuscitate” forms refer only to not resuscitating prisoners experiencing cardiac arrest, the department has relied on them to deny other treatment to prisoners with such orders. The lawsuit also describes how the ADOC leaves prisoners with disabilities isolated and deprived of the care and accommodations they need. Several prisoners reported incidents where they were verbally or physically mistreated due to their disabilities, including guards taunting blind or wheelchair-bound prisoners about their disabilities. The SPLC and ADAP, also a plaintiff in the lawsuit, alerted prison officials to the unconstitutional conditions within state prisons in an April 9 letter. During a meeting with the organizations in May, the ADOC and its medical and mental health care providers did not make proposals to remedy the problems. Contrary to statements by the ADOC and its providers, the SPLC and ADAP have told them about a number of prisoners whose circumstances required immediate attention. Almost none of these individuals’ needs were addressed. Some were victims of apparent retaliation as a result of speaking with the SPLC. 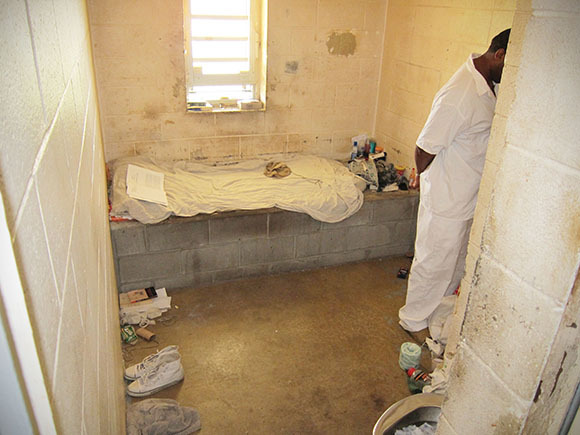 Last week, the groups released a report on the horrific conditions within Alabama prisons, Cruel Confinement: Abuse, Discrimination and Death Within Alabama’s Prisons. The report’s findings were based on inspections of Alabama prisons, interviews with prisoners and a review of medical records, depositions and media accounts as well as the policies, contracts and reports of the ADOC and two major contractors.